Love is the basis to the world's problems, a disease. In Delirium scientist have found a cure, which is required to to given at the age of 18. Lena is an underage 17 year old, and she can't wait for her cure. Her mother supposedly killed herself for love when Lena was 6, leaving her with her uncaring aunt. Lena believes wholeheartedly that love is dangerous, that it needs to be eradicated. That is, until she meets Alex, an invalid who snuck into the city to be part of the resistance. She can't help but fall for him and ends up getting "sick," but she doesn't care. She wants to keep it. The only way Lena and Alex can be together is if they escape into the Wilds. Will they make it over the border safe and live happily? 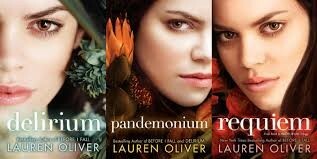 Read Delirium and the two other books of the trilogy to find out. Lena- main character- careful and afraid of turning out like her mom. Hana- Lena's best friend- curious and wants to be different- opposite of Lena. Alex- Lena's love- mysterious, kind and smart. Grace- Lena's youngest cousin- never talks, sweet. I really liked this book and the ones after it. It may seem like it's all about two people falling in love, but it really isn't. I would recommend this book to anyone and everyone. 5 stars.